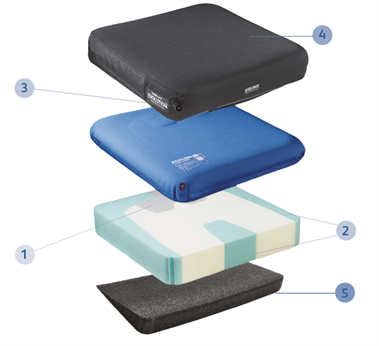 The Varilite Evolution wheelchair cushion uses air-foam flotation to provide skin protection for those at risk of tissue breakdown, and postural support for those with symmetric positioning needs. Weighing less than 1kg, the Evolution uses immersion to redistribute pressure away from those at-risk areas.The ease of use with the self-inflating valve, as well as robust design, makes it a firm favourite with wheelchair users too. The Varilite Evolution come with Pressure Setting Valve (PSV) or Standard Valve to make cushion set-up and adjustment even easier. And for added postural support, combine with a Wave base (see Evolution & Meridian Wave for details). The cushion is available with a mesh or water-resistant cover with breathable two-way strech material. The reticulated foam inside the cover promotes air exchange and improves pressure redistribution. The functional areas of the cushion are created by three types of foam; soft foam under the decubitus-sensitive area of the ITs; medium foam for the thigh trough, pelvic bucketing and pre-ischial bar; and firm foam to provide support through the perimeter and medial thigh separator. Positioning supports improve stability, which is important for users with compromised sitting balance or who transfer frequently. 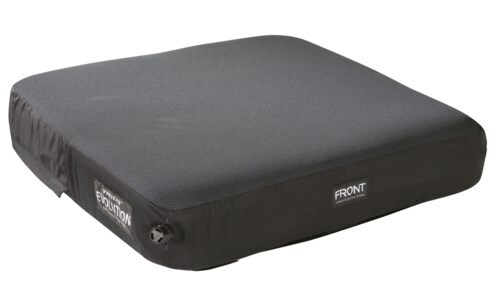 Multi-stiffness foam provides support as the user is immersed in the cushion. Medial and lateral supports minimise internal and external lower extremity rotation. Pelvic bucketing and a pre-ischial ridge help maintain pelvic position, and thigh troughs promote a natural femoral position. The Evolution PSV uses Varilite’s patented Pressure Setting Valve. The Evolution is also available with a traditional two-way Varilite valve. The Evolution comes complete with either a mesh or water resistant cover made from a breathable two-way stretch fabric. Reticulated foam inside promotes air exchange and improves pressure redistribution. The Evolution cover is machine washable, tumble dryable and meets ISO 7176-16 ignition resistance standards for upholstered wheelchair components. A modifiable closed-cell foam wedge is available with each Evolution, to assist pressure redistribution from the sensitive ITs onto the thighs.